hello i am doing a bridge building contest in illinois at my school, Fenwick High School. The bridge must be able to hold 50 kg if i am to have any chance at winning this contest. What design would you recommend? Luke, this is the type of question that I just cannot answer. You have to consider what materials you can use, the span of the bridge, and how dedicated you are to winning and learning what it will take to win. The Pratt, Howe, and Warren trusses are great designs. They have been used for real bridges for over 150 years. Choose any of them. But it is not so much what design you pick, but rather how you build it. The care you take in selecting your materials, and the effort you put into the construction are key aspects to the performance of your bridge, just as much so as the actual design. hey can u help me with a project? I think it has to be a specific size but it has to hold more than 150 pounds. help me. please. I reccomend the howe if u are using stronger wood than mine. mine was thiner and smaller than popcicle stix. i recently made a k-truss brigde in tech-ed class that held over 350 pounds i used hot glue and wood glue and about 100 or so popsicle sticks it was pretty cool because once it broke i didnt just falter ubder the wait it exploded! 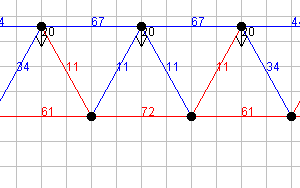 How did you make the K for the K truss using the wood? HOw did you make the < stay on the | ? Get what I mean? Please reply quick! I think the pratt truss is better. someone told me that the compressional members are more efficient if in an I shape or in a T shape. . . Hello!!! im at school trying to win the bridge building competition !!! you guys really helped me!!!! I won a competition at my school too! i wouold like to thank My mom, Garrett Boon, and Michael Jackson for support! Reference the zero force members. In real life, the loads on bridges are applied at the panel points, so those members would carry a load, even if just a panel load. You would make member identification much easier if you were to use Bowe’s Notation. 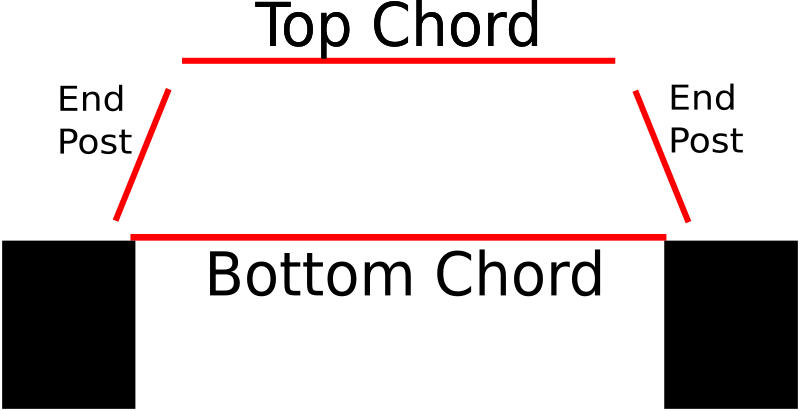 With the external forces shown in place, number all the spaces between the forces. From left to right, label the interior spaces with alpha characters, starting with A. Each force can then be identified by thespace number before and after; each member can be identified either by a number-alpha or an alpha-alpha designation. Thank you for your comment. Could you explain more about panel load? I will look up Bowe’s notation. Do you know offhand where I might find an example (a picture) of it? The panel points are the points where the load is applied, usually the joints on the top and bottom chords. For a bridge, beams, carrying the roadway or railroad, would span between two trusses and apply their loads to those points. For a roof truss, the purlins land at the top chord joints. I found a site for you that shows Bow’s Notation, slightly different than I described because he needed to number the joints for the graphical solution that he describes. The graphical analysis is very accurate, before computers and calculators came on the scene, I used to check my calculated results that way. im making a warren for my elective with balsa wood. what would be better a subdivided warren type or a warren with vertical supports? I do not know what you mean by a subdivided Warren truss. What does this look like? would that be like the pratt truss? Hi I have to make a bridge out of straws and masking tape that spans one meter in between two desks plus it has to hold two 5cm cubes full of sand which i calculated and can be no more than 20grams. The most efficient bridge able to hold this weight wins (least amount of straws). Any suggestions on what type of design i should use? I have the same problem. Can SOMEONE please help us? Where must the cubes be located in the span? In the x and y axis located in the centerfold of the main bridge compartment, DUH! I just built a Warren Vertical Support Truss Bridge out of toothpicks and regular white Elmers glue tha supported 121.7 pounds of sand. This design is typically made for railroad bridges because of the extreme amount of weight a train weighs fully loaded. Good luck. Try using the london crossover? one thing you should do to make the joints stronger is cut vertically up the straw and stick it in the end of the other straw and just use a little take to make sure it stays. please reply 2 me, i need help!!! Nicholas, the force distribution is the same if the load is on the top or on the bottom of the bridge. even though i agree with you, it is the problem of compression VS tension that i am up against. so, what bridge would you recommend that will make me win the bridge building contest of 2015? thanks for the tips. i have to make a balsa wood bridge that will support 15 kilos in the center and the truss designs really helped. The school I got to St.Peters grade 6s had to build a bridge for Design+Technology and this website has really helped alot thank you!!! I love this site…it gave me a lot of help for our project. Thanks soo much. I just hope that the bridge that my group makes wins. Um, our bridge is meant to be 40 cm long and we have 150 paddle popsticks to complete it. Anyway, thanks a lot again. this is a good webstie for teens and it gives the motives for kids to learn how to build bridges. is this Mrs. Goodfellow from CMS??? Why yes, I am from CMS. Actually, he meant to say that the two black arrows above the bridge represent a single weight, distributed evenly between those two arrows (thus, 2 points at 50% each = 100%), the numbers on the bridge lines are the force amounts(not percentage) most likely, in Newtons. Hope that helps explain things better. There are many free online bridge building games for you to try your own designs and see how they work. I tried a K-truss design in one program from West Point, but the forces were completely reversed. It might have been the program’s physics, but I’m not sure. I had lots of compression at the top and tension at the bottom.
. It is the simplest design of the Truss Bridge, with two sides, a bottom, and the railing in simple triangle forms. The bottom of the side of the bridge is 11 inches in length and the top of the side is 10 inches in length. The little rails on the inside of the left and right side of the bridge are 2 inches in length. The bottom of the bridge…… Some of the things I learned in making this bridge were the different jobs involved in the process of actually building a real bridge. You need to have an engineer, an architect, a scientist, and a mathematic. You would need an engineer to help design the bridge. You would need an architect to oversee the construction of the bridge. Also, the architect would prepare information on the structure’s design and specifications, materials and equipment, estimated costs, safety, and construction time. They also make scale drawings and make sure that the bridge meets the building codes and laws. Also, to build a real life bridge, you would need a mathematic. They would make sure that all the little details in the bridge were exact and specific so the bridge was safe, and also look right. Has anyone else noticed that the K Truss looks like it has arrows in it as well as Ks? Its like an optical illusion! Great Website, and thanks for the tips! oh yeah, i just noticed that. That’s really cool. Hey Liam are you in the Snowshoe Ski Team???? For a science fair i have recently done, i had the warren, pratt and howe trusses all trusses. In this test, they were weighed by hooking a rope to the bottom beam, putting a bucket on the rope, and adding coins to the bucket (and a ten-pound weight). Of course i had 30 pounds of coins. Thanks, very much for that insight Liam. It was very helpful and I am very appreciative. i would also like it if you just posted here on the website!! sorry if that sounded wierd :D/:( !!!! Rose, part of the reason I have the option to leave comments is so people can share their opinions about my bridges or projects they have worked on. I also have an option for people to upload photos of their own bridges, so this site is not just my own work. Any bridge can break within 5-10 minutes. It depends on how strong it is and how fast you load the bridge. Yeah I’m doing the same thing but we have to use toothpicks which is so much hard so yeah if any of you have advice I would like to hear it but it will be hard! i made a truss bridge that was 40 cm long. i used the warren truss design. i added vertical suports also though. it was made from popsicle sticks and wood glue. the key is distrubuting the weight evenly. my bridge held over 200 lbs. depending on the materials and how much you have to work with, you should be able to do the same. Also a determining factor would be exaxtly how the weight is going to be applied to your bridge. i also forgot to mention that my bridge was 10cm wide. 200 pds wow if u want us to believe u say something reasonable 40X10 cant hold 200 pds it would have to be 50 cm high considering u used normal wood glue. Sorry, but yeah it could certainly hold 200 lbs. He most likely beefed it up with a lot of popsicle sticks. Wood glue is good enough if used properly. I saw a vid on youtube with a simple king post that held so much, they were running out of things to use as weight. It was REALLY strong. hey josh im tiana and im in yr 7 and we are making bridges and how do you know if it is the write bridge and there is other choices what do you do ?????? When you stated that for a Howe Truss you would have to use larger compression members, were you referring to the diagonal members or vertical members? Thank you for your clarification. 39 queries in 0.506 seconds.